Britain’s Alice Kinsella earned an unexpected medal in front of her home crowd at Arena Birmingham in one of the two International Gymnastics Federation (FIG) World Cups taking place. 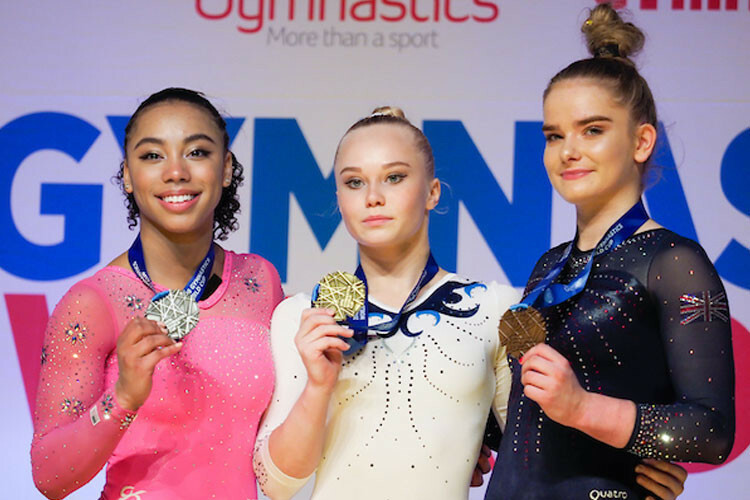 She took all-around bronze behind Russia’s gold medalist Angelina Melnikova and silver medalist Margzetta Frazier of the United States. Meanwhile at the FIG World Cup in Qatar, Japan’s multiple Olympic and world medalist Kōhei Uchimura endured his second day of disappointment as he failed to qualify for the finals of the men’s vault and horizontal bar. Kinsella secured her medal with a final score of 53,099 points. “I was just hoping to get the experience for the Commonwealth Games but to come here and get a medal; I don’t know what to say really,” said Kinsella. Melnikova scored 54,465, with Frazier totalling 53,932. Uchimura, a seven-time Olympic medalist and 19-time world medalist, had another unhappy experience in the 11th FIG Artistic Individual Apparatus World Cup at Doha’s Aspire Dome. In the first event, the 28-year-old, widely regarded as one of the best in his era, finished 10th with 14.100 points. Ukraine’s Igor Radivilov and Chinese duo Huang Mingqi and Qu Ruiyang took the first three positions. “I will check all the footages of my performances when I get back to Japan – I need to work on my weaknesses,” Uchimura told www.dohagym.com. Eight top competitors will contest the podium finish in the finals. Uchimura, who missed out on his seventh consecutive world title last year in Montreal, also failed in the horizontal bar, where he ended up 10th. China’s Xiao Ruoteng, who succeeded him in Montreal, topped the qualification, followed by France’s Edgar Boulet and compatriot Deng Shudi. French duo Melanie de Jesus and Marine Boyer took the first two qualification spots followed by Belgium’s Nina Derwael in the women’s balance beam. Japanese duo Yuki Uchiyama and Nagi Kajita also made it to the finals. But Uzbekistan’s veteran gymnast Oksana Chusovitina, who had qualified for the vault final yesterday, came 12th. Britain’s Taeja James reached the finals with an effort of 13.533 points followed by Rune Hermans of Belgium, Elisa Meneghini of Italy, Nagi Kajita of Japan, Liu Jinru of China, Lara Mori of Italy, Kim Su Jong of Korea and Marine Boyer of France.